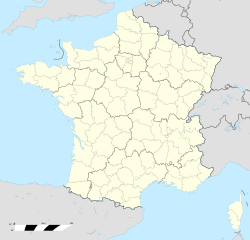 Paris–Le Bourget Airport (French: Aéroport de Paris-Le Bourget) (IATA: LBG, ICAO: LFPB) is an airport located within portions of the communes of Le Bourget, Bonneuil-en-France, Dugny and Gonesse, 6 NM (11 km; 6.9 mi) north-northeast (NNE) of Paris, France. Once Paris's principal airport, it is now used only for general aviation including business jet operations. It also hosts air shows, most notably the Paris Air Show. The airport is operated by Groupe ADP under the brand Paris Aéroport. The airport started commercial operations in 1919 and was Paris's only airport until the construction of Orly Airport in 1932. It is famous as the landing site for Charles Lindbergh's historic solo transatlantic crossing in 1927 in the Spirit of St. Louis, and had been the departure point two weeks earlier for the French biplane The White Bird (L'Oiseau blanc), which took off in its own attempt at a transatlantic flight but then mysteriously disappeared. On 25 June 1940, Adolf Hitler began his first and only tour of Paris, with Albert Speer and an entourage, from Le Bourget Airport. On 16 June 1961, the Soviet ballet dancer Rudolf Nureyev defected at Le Bourget Airport. In 1977, Le Bourget was closed to international airline traffic and in 1980 to regional airline traffic, but remains serving both domestic and international business aviation. Since 1975, Le Bourget Airport has hosted the Musée de l’air et de l’espace, France's main state-owned aviation museum. Following the discontinuation of regular commercial traffic in 1977, space available to house museum collections and displays has progressively increased. The airport hosts a statue commemorating Frenchwoman Raymonde de Laroche who was the first woman to earn a pilot's licence. There is also a monument honouring Lindbergh, as well as Nungesser and Coli, pilots of The White Bird. On 14 April 2016, the Groupe ADP rolled out the Connect 2020 corporate strategy and the commercial brand Paris Aéroport was applied to all Parisian airports, including Le Bourget airport. The Bureau d'Enquêtes et d'Analyses pour la Sécurité de l'Aviation Civile (BEA) is headquartered in Building 153 on the grounds of Le Bourget Airport and in Le Bourget. Le Bourget Airport hosts the Musée de l'Air et de l'Espace, which is also located in the commune of Le Bourget. Lothar von Arnauld de la Perière in 1941 was killed when his plane crashed on takeoff near Le Bourget Airport. On 29 August 1948, SNCASE Languedoc P/7 F-BATG of Air France crashed at Le Bourget. On 7 April 1952, SNCASE Languedoc P/7F-BATB of Air France was damaged beyond economic repair when it overran the runway on take-off. The aircraft was operating an international scheduled passenger flight from Le Bourget to Heathrow Airport, London. On 3 June 1973 a supersonic Tupolev Tu-144 crashed during an aerial display at the Paris Air Show, in an incident known as the 1973 Paris Air Show crash. On 25 July 2000, Air France Flight 4590 attempted to divert to Le Bourget before it crashed shortly after takeoff from Charles de Gaulle Airport. Le Bourget Airport is the base for the "Paris Airshow Demonstration Flight" mission supplied with Microsoft Flight Simulator X. ^ LFPB – PARIS LE BOURGET. AIP from French Service d'information aéronautique, effective 28 March 2019. ^ Godspeed, Charles and Francois. "The Secret of The White Bird." aero-news.net, 9 May 2006. Retrieved: 16 January 2009. ^ "Hitler Tours Paris, 1940". Eyewitnesstohistory.com. Retrieved 21 May 2012. ^ "1961 - Rudolf Nureyev defects to the West". Nureyev.org. Retrieved 22 March 2018. ^ "Présentation". Musée Air et Espace. Archived from the original on 13 March 2015. Retrieved 1 March 2015. ^ "Nungesser & Coli Vanish Two Weeks Before Lindbergh Crosses The Atlantic". Documenting Reality. Retrieved 3 January 2018. ^ "Plan d’accès au BEA Archived 16 February 2012 at WebCite." Bureau d'Enquêtes et d'Analyses pour la Sécurité de l'Aviation Civile. Retrieved on 17 June 2010. ^ "header_logo_et_coord.gif Archived 21 June 2011 at the Wayback Machine." Bureau d'Enquêtes et d'Analyses pour la Sécurité de l'Aviation Civile. Retrieved on 17 June 2010. ^ "Address and Directions." Musée de l'Air et de l'Espace. Retrieved on 9 September 2010. ^ "F-BATB Accident description". Aviation Safety Network. Retrieved 27 February 2014. Wikimedia Commons has media related to Le Bourget Airport.